Home » Mali » Why are Mali’s Rural Peasants Supporting the Coup? Why are Mali’s Rural Peasants Supporting the Coup? Democracy beyond the ballot box has been hard to come by for millions of Malians. 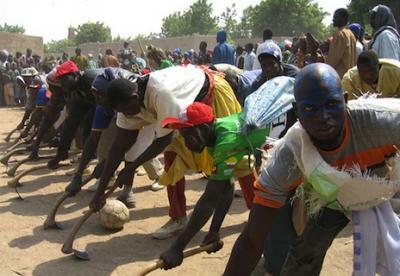 Hoe down: Malian farmers performing a traditional hoe dance. Photograph by Lisa Goldman. What does it mean when civil society groups in rural southern Mali like the Syndicate of Peasants of Mali announce their support for the military junta, and its National Committee for Recovering Democracy and Restoring the State (CNRDR)? The peasants’ syndicate, with their motto of “Land, Work, Dignity,” has asked the junta to pursue four goals: restore the ideals of 1991’s pro-democracy movement; manage the crisis in the country’s north; fight corruption; and work to restore expropriated lands. These are risky moves in a time of political uncertainty and near-empty granaries. But such recent announcements, among others, in support of the military coup in Mali speak to the fragile economic situation that has developed alongside the country’s robust electoral system. Thus, when examining Mali’s current political crisis, we must carefully consider how ordinary Malians view the privatisation of their lands, resources, and public companies by foreign enterprises. Indeed, unchecked neoliberal economic policies imposed from without threaten the viability of sustainable democratic institutions and the very social fabric that makes democracy work in the first place. The coup may not have been caused by a rising tide of discontent, but it helps explain why some Malians, who have been steadfast supporters of democracy, now not only tolerate the military junta, but support it. To be clear, acknowledging peasant and worker grievances does not excuse the putschists for their grievous error of expressing dissatisfaction through mutiny and, however inadvertently, overthrowing the democratically elected Amadou Toumani Touré (known popularly as ATT). Despite ATT’s many perceived failings and unpopularity, he was still the constitutional representative of the will of the people. Legitimacy via the ballot box trumps any ex post facto legitimacy that the CNRDR might have accrued after their coup d’état. 1 Cottoning on to concerns? Not too long ago, Mali was the darling of the aid community and a leader within ECOWAS (Economic Community of West African States), lauded for its stable democracy. Burdened with crippling debt after 22 years of rule by a clique of military men, it worked with the World Bank and IMF. In recent years though, we have witnessed a transformation of the Malian economy to the benefit of foreign capital and private interests, but ultimately to the detriment of Malian peasants and workers. Much of this hasn’t made the news, and much of it has been deliberately hidden from public scrutiny. ATT’s government engaged in secretive deals at a time when Malians were growing weary of corruption and the deteriorating economic situation. Mali is overwhelmingly a peasant society, and cotton is the backbone of the Malian economy. In fact, cotton – together with livestock and gold – accounts for up to 90% of the country’s export revenues. The Malian Company for the Development Textiles (CMDT) buys peasants’ “white gold” and sells it abroad. But even when the CMDT pays on time, which has been a big issue for farmers, its cotton prices have remained low in order to be competitive in the unequal world market. But changes are occurring in cotton production in Mali. In August 2008, Mali’s legislature voted to fully privatise the CMDT. In 2010, the Malian government divided the CMDT into four subsidiaries and offered them up for privatisation. And in December 2011, a Chinese company, the Yuemei Group, which already owns cotton fields and garment plants elsewhere in Africa, agreed to buy two of the subsidiaries. Peasants mobilised against these changes. In fact, just one month ago, the aforementioned Syndicate of Peasants of Mali, and more than 600 peasants, met in Koutiala to express their concerns about privatisation and related agricultural policies. Furthermore, in recent years, many farmers have shifted their agricultural strategies to focus on grain production, which at least offers a measure of food security. Beyond concerns over cotton pricing and agricultural inputs, access to land is under threat. Across the continent and decades after independence, de facto recognition of communal tenure systems is giving way to de jure state ownership, allowing for further privatisation of farmland, especially with the leasing of productive farmland to Libya and soil-poor but cash-rich Gulf states. These developments have similarly sparked broad-based resistance. In November 2011, Malian peasants converged on the southern village of Nyéléni to protest land sales to foreign interests. Other participants came from 30 different countries, speaking to the international nature of the threat of land grabs. Recent reports suggest that by December 2010, the government in Bamako had negotiated the lease of 544,500 hectares of Malian land to just 22 foreign investment firms, with 40% of the land targeted for the production of biofuel. These lands could otherwise support the livelihoods of half a million smallholder farmers. Furthermore, shifting land away from food production threatens the country’s goal of agricultural self-sufficiency and, in the wake of the 2007-2008 food price crisis, it also threatens the urban food markets that rely on the countryside. Aside from land and farming, runaway privatisation has made inroads into other sectors of the economy: the railroad, the telecommunications company, utilities, gold mines, and vegetable oil factories are controlled by private stakeholders with a penchant for cost-cutting, producing stagnant wages, discontent, layoffs, and protests. But the government has ignored workers’ voices, and labour leaders have been dismissed and even imprisoned. Far beyond ATT’s incompetence in dealing with the northern insurgency, widespread discontent has grown in both urban and rural areas as people have come to believe that their role in the democratic process is limited to casting ballots every few years. While outside observers are keen to understand – and measure – Malian democracy through elections, reforms imposed from the outside and implemented by elected governments have made democracy beyond elections, a less representative practice and – disturbingly – sometimes an unpopular term. While Malians are proud of their elections, which they see as indigenous expressions of cooperation, tolerance, consensus-building, and decentralised governance, they also acknowledge that maintaining democracy is messy and difficult, particularly as the economic situation and the moral state of the elected government test their patience. Thus, the crisis of Malian democracy was not solely the result of an accidental coup, drought, or separatist wars. Still, it is no secret that Mali’s democracy was in crisis long before the coup. A firm Malian belief in recognisable justice and democratic participation drives today’s critiques of ATT and the CNRDR and must be taken seriously when debating the future of Malian democracy. PreviousPrevious post:Mali’s CNRDR: An Accidental Coup? Next Next post:Mozambique’s Forgotten Soldiers: Who Counts as a Veteran?